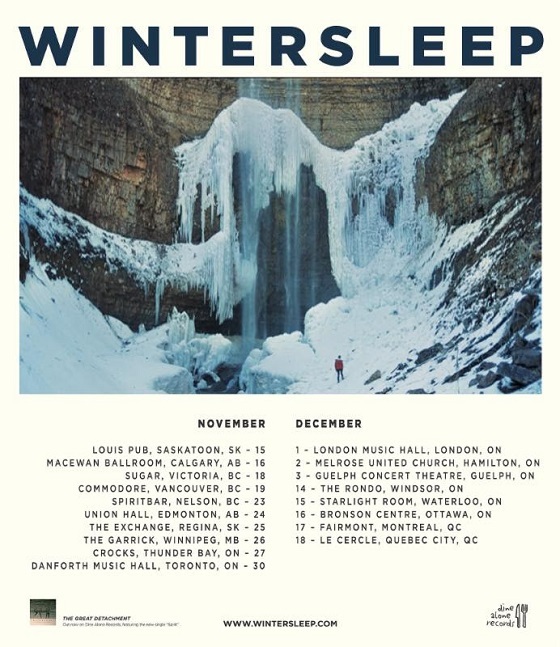 After issuing their The Great Detachment collection earlier in the year, CanRock mainstays Wintersleep have announced they'll be reconnecting with Canadian crowds on a forthcoming headlining tour. A press release explains that while the quintet are due to start a European trek this coming weekend, they'll be back to playing Canadian clubs by November. The 18-show headlining tour kicks off in Saskatoon and works its way over from the Prairies towards Vancouver Island, before richocheting back eastward. Wintersleep's final show of the bunch will be in Quebec City on December 18. You'll find all of Wintersleep's international schedule, including a few dates with Hannah Georgas, down below. The group have also unveiled a new live video for "Spirit," which you can see by scrolling past the list of shows. As previously announced, The Great Detachment is Wintersleep's sixth full-length release. It was written in Montreal, but tracked at Halifax's Sonic Temple studio with producer Tony Doogan (Belle & Sebastian, Mogwai), and features a guest spot from Rush bassist/vocalist Geddy Lee.